Pick of the Week: 20% Off Reading Comprehension Tools! Reading comprehension is important for children of all ages, but especially young learners, as they learn to develop and process words and text. 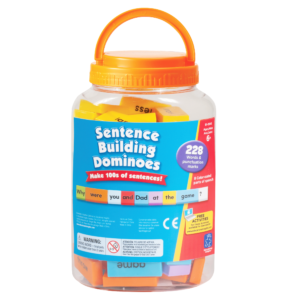 Pictured to the right is our featured product, the Sentence Building Dominoes, a game you can build a variety of sentences with. With 228 color-coded dominoes, featuring 8 parts of speech — nouns, pronouns, verbs, adjectives, adverbs, conjunctions, prepositions and punctuation marks — the possibilities are endless! Dominoes come packed in a handy storage bucket. Be sure to check out the rest of our products on sale this week. Save 20% on your purchase of select Reading Comprehension Tools by entering the Promo Code READ20 at checkout! Written by: Different Roads to Learning on October 18, 2016. This entry was posted in ABA, Pick of the Week and tagged reading comprehension, reading comprehension skills, reading comprehension tools, reading skills by Different Roads to Learning. Bookmark the permalink.